I had started working with my psychic friend Cheryl. She had monthly circles where people would come together and explore and grow their budding intuitive gifts. I remember speaking in tongues during one of our sessions and she suggested that I tune into the language to find out if there was more going on than just speaking a strange language. I did this by taking long walks in the woods by my apartment building. Nature has always had a calming effect on me and being surrounded by trees was an easy way for me to meditate and go within. 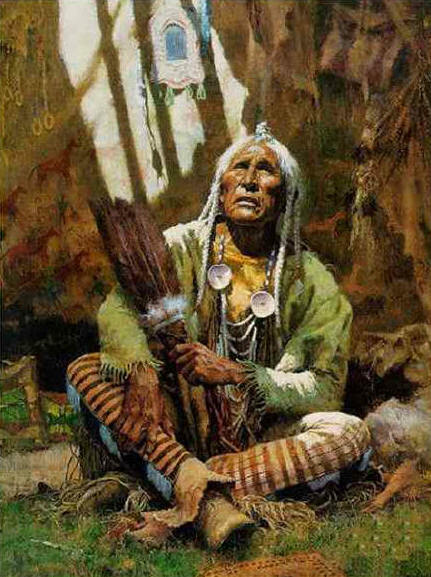 During these nature sessions I would begin to see images of an old Native American Holy Man in my minds eye. I started to sense that he was my Spirit Guide and the strange language was coming from him. After several attempts of trying out different names to call him “Grandfather” resonated deep within me. It was the name that felt right. After connecting with his name I began to have conversations asking about our relationship. He told me that we had several past lives together and that this lifetime he came to help me become who I truly am. It took a long time before I could fully understand and interpret what he was saying. He began by sending me images that the words reflected. From there I was able to interpret the spirit language into messages for myself and others. My Spirit Guide Grandfather has helped me during my healing sessions with clients for many years now. He will often give insight into a situation that I am unable to see clearly. I have come full circle with the work that began with Cheryl B. many years ago. I now have psychic circles to help others explore their gifts. You can find more about these circles here. I have enjoyed sharing my story with you as it has reminded me of the incredible journey I have been on. Please feel free to connect with me if you would like your own session with Grandfather. We would be happy to help you in becoming who you truly are. You can find me here. Here is an example of me channeling my Spirit Guide Grandfather. Enjoy! Previous PostHow I Became A Psychic: Part 2Next PostI’m Not Crazy. I’m Psychic.